A week after streaming music company Deezer announced that it had raised another $109 million from existing investors, news has leaked out that its bigger rival Spotify is raising again, too. The Stockholm-based company whose music streaming service works in 58 countries is seeking to pick up an extra $500 million from investors in the form of convertible notes, according to a report in Swedish newspaper Svenska Dagbladet (in Swedish) that we have also confirmed with sources. The investment would turn into discounted shares in the company were it to go public. This newest round of funding would come in the form of a loan, where Spotify will pay 4% on the borrowed money. As this is not an equity round, those who contribute to the $500 million raise will be able to convert that loan into Spotify shares down the line, with a discount depending on the timing of the IPO. If it happens within a year, they would get a 17.5% discount on shares; if it’s more than a year away, the discount will increase 2.5 percentage points every six months. The IPO, the report says, may be done as a joint listing in Stockholm and the U.S.
To be clear, this is not a signal that Spotify has set a date for any IPO process — contacted for comment a spokesperson declined to comment, but a source told us there is no news on a date. It is notable that the company is leveraging the idea of a public offering as part of the fundraising efforts nonetheless. From what we understand, the company was not needing to raise more money right now but is going about it “opportunistically,” according to one source. The fundraising document does not specify too much about how Spotify plans use the new funds except to note that it could use it for opportunities in new markets. Whether that would be for acquisitions or for marketing of its own service is not clear. The report notes that Goldman Sachs and Nordea are handling the new fundraise, but that at least initially all is not going to plan. A second, separate report in the same publication notes that the company has been getting a cool reception from investors that have been approached to participate in this round. The report says that these investors are citing encroaching competition: presumably they are referring not just to pure-play streaming services like Deezer but larger platforms like Apple Music, which can potentially run its music services as a loss-leader to bring people to the real prize: buying Apple’s pricey hardware. The report also says that these investors would have preferred more of a standard IPO process to have better transparency on Spotify’s finances and revenue-generating potential. (How dare they! This is a startup we’re talking about.) The company is understood not yet to be profitable globally, although some individual markets appear to be tipping into the black. This is not too surprising to hear: the type of investor approached for convertible notes will often be less risk-averse. It will be looking at the company less like a VC hoping for a 10X return, and more like someone getting in early on an IPO. 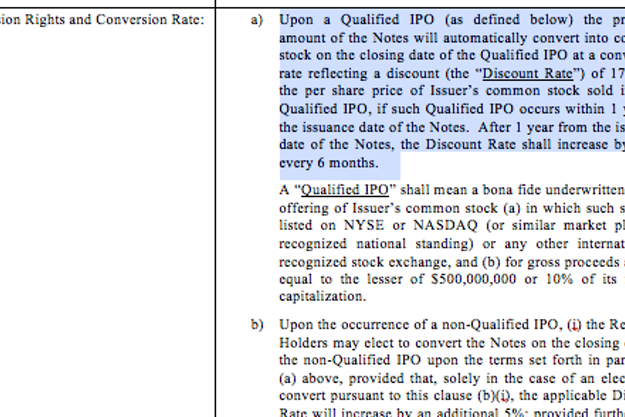 The nature of the funds being in a convertible note mean that they do not automatically convert into shares in the company, but leave the door open for Spotify to tap the funds ahead of a public offering, should it need more cash before then and the private VC markets potentially become harder to tap for an new equity round. This would match up with a lot of the chatter we have been hearing from founders worried about raising money as easily in the future as it is right now, with the changing economic climate. All of this also means that it’s not clear whether the valuation of the company would change with this round. Spotify’s last valuation was at over $8.5 billion, on the back of a $526 million round in June 2015. The company has to date raised over $1 billion in funding, with investors in the company including Swedish carrier Telia, Accel, DST, Creandum, Fidelity, Founders Fund, KPCB and Northzone, among several others. Spotify today is the leading music streaming service, with 100 million users overall and about 28 million of them paying (note: these are updated numbers in the Swedish newspaper report, and are higher than the 75 million free and 20 million paying users that Spotify has been reporting). It is currently taking some 60% of all consumers coming to streaming services for the first time. But others are working to pick up the next wave of users, or simply to tempt Spotify’s customers away. They include the likes of Deezer but also larger platform players like Apple and Google. It was recently revealed also that Soundcloud raised an additional €32 million in a debt round. The latter streaming service, which is based around audio content that users upload themselves (similar to videos on YouTube) has around 175 million users, well ahead of Spotify just in basic numbers. However, it doesn’t yet have any subscription models and so far only runs ads in the U.S. market. At the same time, Spotify is adding more services and features into the mix. And the company this week added video on Android in the UK, US, Denmark and Sweden. It will start appearing on iOS next week, a Spotify spokesperson confirmed to TechCrunch.